Thank you once again for our fabulous Wedding outfits. The Day was perfect and we both felt amazing. Our wedding day was absolutely amazing, the best day ever! 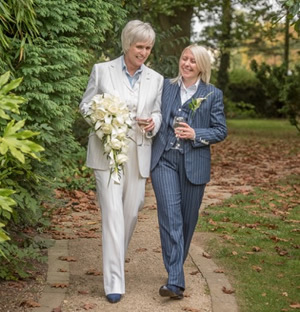 Our suits looked absolutely fantastic and we got so many lovely comments about them. Thank you again for making us look a million dollars on our special day. I have had so many compliments on the garments you have made me - you have no idea what it is like to stand in front of clients and they say 'That is a beautiful suit/jacket. Who made it for you?' No one has ever asked me that before. Even better, when in Glasgow this week every one of the clients said I had lost weight - they have known me a while so we have this type of rapport - it has to be the tailoring because I sure haven't.... Now, can you make me 10 years younger?! Geoff and Laura, I have to admit to being somewhat nervous the first time I rang up thinking that a "tailoring" service meant being exposed, measured, and prodded - but I couldn't have been more wrong, thanks again for another great visit on Saturday. 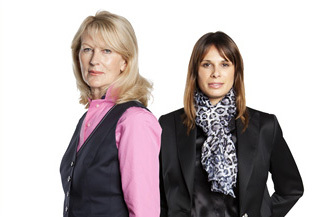 We look forward so much to our trips to Woburn - just a couple of hours down the M6 - benefiting from your combined expertise and personal attention - relaxing over lunch before coming back to pick up the latest outfits and knowing that the results will look (and make me feel) like a million dollars! Hacking jacket has been worn twice already - and GREATLY admired and I do mean ............wow, beautiful jacket. Hope to wear the other one this weekend to party!